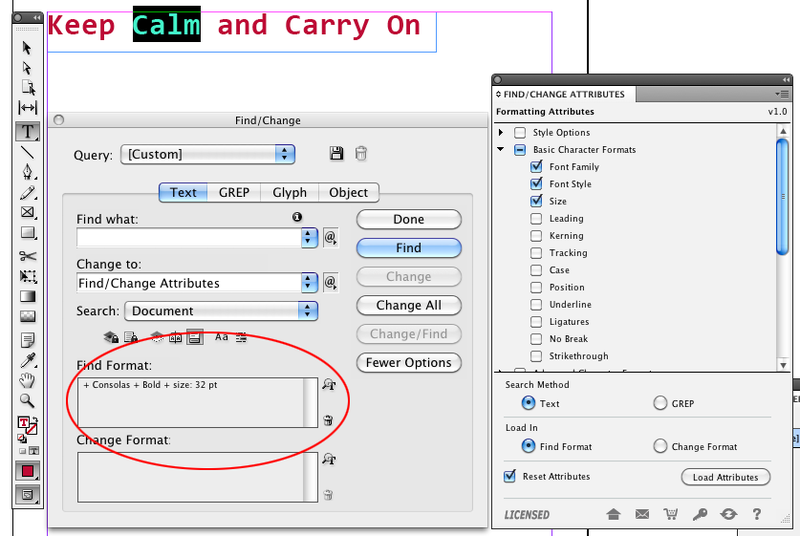 Find/Change Attributes (FCA) is an extension for Adobe InDesign that enables you to load formatting attributes from selected text into the Find/Change dialog. 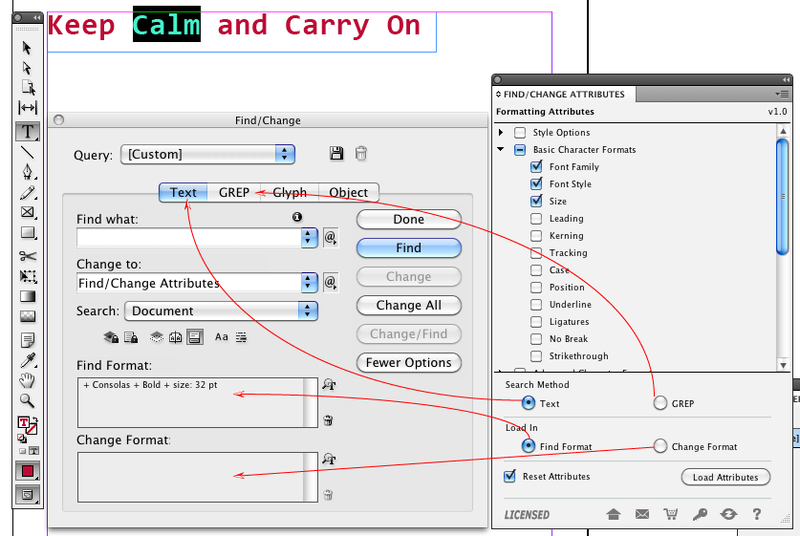 FCA is a productivity tool for those who use heavily the Find/Change dialog. This extension was specially design to be simple and intuitive to use, as well as to "blend" with the native features and functionality of Adobe InDesign. FCA has been partially localized for German, Dutch and French. Find/Change Attributes is dedicated to Cari Jansen who has been a constant source of inspiration and Automatication unconditional supporter. The trial version of FCA is a fully functional version with no time limit. The only limitation is that you can only load two formatting attributes at the time. FCA is platform independent extension; the same software will run on Adobe InDesign CS5, CS5.5 and CS6 on the Mac OS or Windows. You can purchase FCA directly from our Web store. After purchasing FCA you will receive an email with the receipt of your purchase that will also include a serial number and the software download link. The serial number will be used to unlock the limitations of the trial version. The version of FCA you are using. The version of Adobe InDesign where FCA is installed. 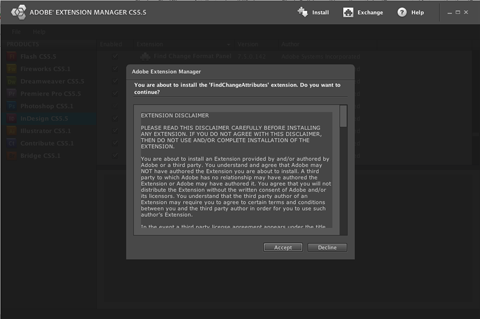 To install Find/Change Attributes extension, you must have Adobe Extension Manager (CS5/CS5.5) installed. Adobe Extension Manager provides an easy and convenient way to install and delete extensions in Adobe applications. 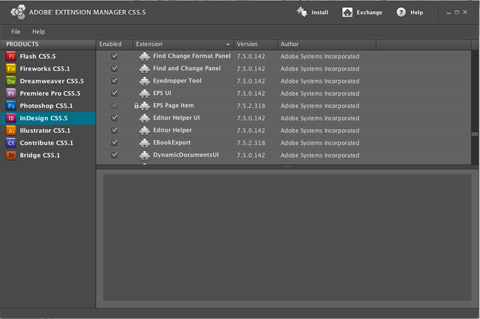 Adobe Extension Manager normally gets installed automatically when you install Adobe InDesign (CS5/CS5.5). Adobe Extension Manager can normally be found in the Applications folder (Mac OS) or in the Adobe folder inside the Program Files folder (Windows). IMPORTANT: For those using Mac OS 10.7, you MUST update Adobe Extension Manager CS5 and CS5.5 to the latest version in order to be able to install FCA. 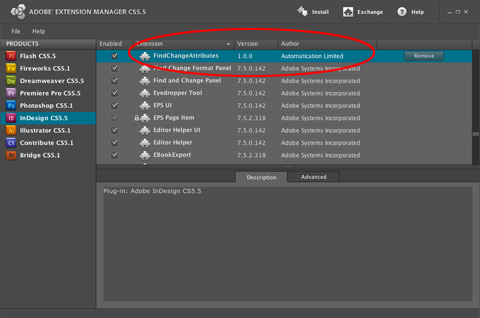 if you have Adobe InDesign CS5, CS5.5 and CS6 installed, you will probably also have Adobe Extension Manager for CS5, CS5.5 and CS6, so make sure that you open the correct version. • Double-click FindChangeAttributes.zxp file in Windows® Explorer (Windows) or in the Finder (Mac OS). • FCA extension should appear immediately in the extension list. After purchasing FCA through our Web store you need to activate the plug-in using the serial number you will receive via email. You should keep the serial number in case you ever need to re-activate FCA (if you change computers, or reinstall the operating system, for example). To activate FCA you need to enter the serial number in the trial version of the software. The trial version will become a full working version. The trial version can be downloaded from this page. If you have ordered multiple copies in a single order, you will receive a single serial number that will activate as many copies you have purchased. The license is computer based, which means that you can activate Adobe InDesign (CS5.x/CS6) if they are installed in the same computer. After purchasing FCA, you will need to wait about 20 minutes for the activation servers to be update. You might get the error message "Unknown Serial Number" if the activation servers are not updated. • Choose Window > Find/Change Attributes to show the panel. • Click the Activate/Deactivate... button and then enter or paste the serial number. • Click the Activate button. When FCA is successfully activated, the word "LICENSED" is displayed in the lower left corner of the panel. If you have activated FCA and want to move the license to another computer, you need to deactivate FCA. • Click the Deactivate button. Once FCA has been successfully deactivated, it will default to trial mode ("TRIAL VERSION" will appear in the lower left corner of the FCA panel). 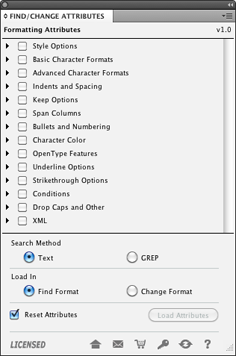 • Choose Edit > Find/Change to show the Find/Change panel, so you can see the formatting attributes being loaded. 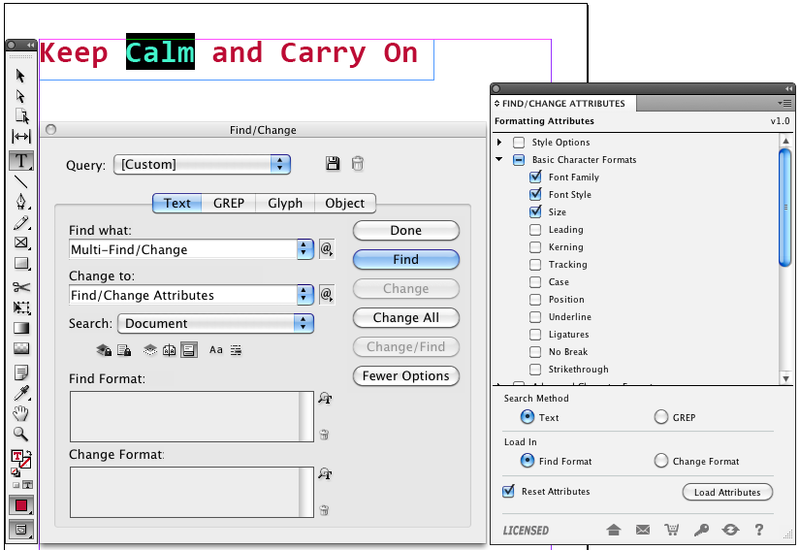 • Select the text from which you want to get the formatting attributes. • In the Find/Change Attributes panel select the formatting attributes you want to load in the Find/Change dialog box. • Choose where to load the formatting attributes by selecting the radio button Find Format or Change Format. • Select Reset Attributes checkbox if you want to remove any existing formatting attributes in the Find/Change dialog before FCA loads the selection formatting attributes. 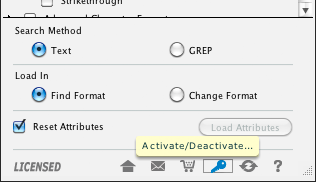 The text shortcuts (Ctrl-V, Ctrl-C and Ctrl-X) won't work on most modal dialog box. The workaround is to use the contextual menu (right-click) and then choose the command you wish.